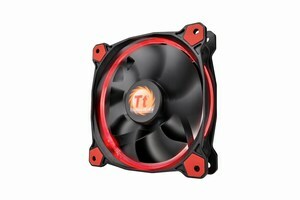 Ring 12 High Static Pressure LED Radiator Fan: Thermaltake has released the new Ring 12 LED Series, a 120mm fan fitted to enhance static pressure that produces impressive cooling performance with an optimized fan blade. Hydraulic bearings for silent operation guarantee ultra-low noise. In addition, an anti-vibration mounting system strengthens the stability during operation. The patented LED Ring maintains color and brightness uniformity; the lighting effect is visible from all sides and angles. The four-colored LED ring (in blue, red, white, and green) adds style to the chassis. Concentrated Compression Blade (CCB) for high-static pressure of demanding applications such as radiators, the CCB is engineered to focus the inner weaker circle of air outwards, allowing the outer section to pressurize and compress the air. Wind Blocker Frame: To achieve maximum static pressure in all applications, the frame is designed to work with the CCB to reduces the blade's noise and vibration, creating a perfect balance between power and sound. Hydraulic Bearing/Low-Noise Design: The hydraulic bearing self-lubricates with a high quality, friction-reducing substance which lowers operating noise and improves efficiency. The Low-Noise Cable can reduce the noise level by 24% from 24.6dBA to 18.7dBA. Four colors of the Patented LED Versions Available: Ring 12 LED Series is also available with different LED versions (red, blue, green, and white), adding cooling aesthetics to the chassis.